If you lift your kitten by the “scruff of his neck” please stop. Some people think that is how mothers carry their kittens, but really — it isn’t. They actually grasp them at the base of their neck, just above their shoulders, gently lifting the whole kitten, not just the kitten’s skin. 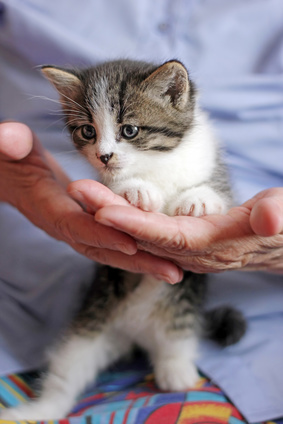 In addition, the kitten is just an inch or two off the ground, not a foot or more as she is when picked up by a human. Since you have two strrong hands at your disposal, picking a kitten up by the scruff is something you shouldn’t do at all. Get a kitten used to being lifted by lifting him shorter distances. Sit on the floor with him and lift him from the floor to your lap. When he is more confident, try from the floor to your arms above your lap. Then try from the floor to your lap while you are seated in a comfortable chair. Finally from the floor to your arms while you are standing. If you are using both hands and your cat still meows, maybe you need to support his feet more so he doesn’t feel like he is dangling. If you are lifting your kitten properly and he still complains do take him to the vet to rule out anything medical. Likewise, when you lift your cat, don’t turn him upside down like he’s a human infant. He isn’t. This is something many cat lovers do the wrong way. We tend to look at it as cuddling. To them, it’s ensnarement. While their tummies are soft and sweet to us, to a kitten, exposing his underside just makes him vulnerable. Let him decide when he will expose it to you. Moreover, when a cat opens up to you in that way, it is a wondrous sign of her trust in you. You can’t experience that if you force it.